The Sport Performance Data & Fan Engagement Summit continued today in London with some intellectually stimulating presentations and discussions with some of the innovators of the industry. I summarised some of the key points below. Thanks to the Sports Innovation Network for putting together this fantastic two-day event. La Liga has its own guide for regulating broadcasting of their competitions. Since broadcasting the first football matches, the position of main camera hasn’t changed – showing that football stays a traditional sport. La Liga has aerial cameras on 8 stadiums from the first division. Intel True View (technology first used in NBA and NFL) is installed on 6 stadiums from the first Spanish division. This technology allows the director of the transmission to see the action from the players’ perspective and essentially from any angle. Behind it stand 38 5K cameras positioned in the stands of the stadium. It also gives the fans the chance to ‘be the player’, staying at home on their couch. In La Liga’s transmissions, the Spanish league has also introduced live 3D graphics showing facts as the player’s speed or the ball’s trajectory. 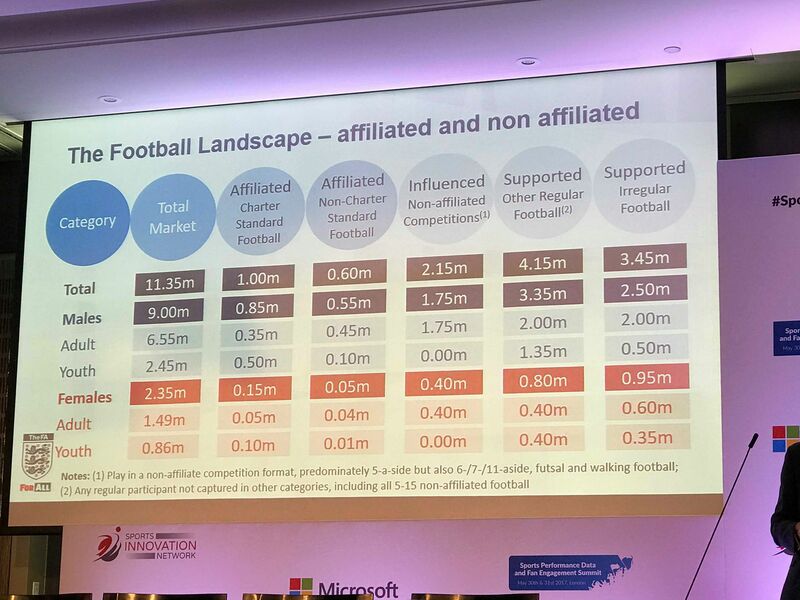 The technology above helped La Liga to increase the fan base – North American market grew by 58% and Asia-Pacific by 76%. 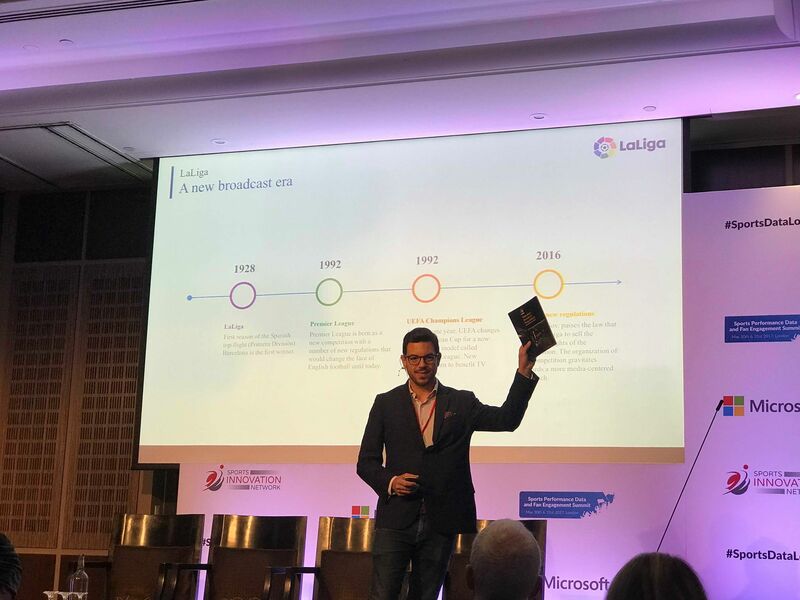 The adoption of this technology has also pushed the digital growth of La Liga – by 49.9% in one season. They have over 41m facebook fans and 1.5m weibo fans. La Liga matches are broadcasted during 10 different time slots, so that they can fit the global audience. In terms of content, WWE tries to find a right balance – there is no one size fits all! Customer is the key – not the content. Jonathan from SportRadar spoke about the gap between two personas – on one hand a football fanatic, very passionate about the game who knows all the players, lots of facts and could watch sport all day, on the other hand a younger person that follows football for the hairstyles, clothes and tricks made by the players; they are likely to use ‘rewind’ so that they will Instagram all these and maybe transform them into memes. Expectations need to be carefully managed for both categories. FIBA tries to get people talk with each other, rather than trying to get a dialogue going on with the fans. FIBA looks at transforming every one of the 7 models of storytelling into stories suitable for their audience. The small size of Swansea City AFC, allowed the Digital team at Swansea to take risks. Clubs need to create a reason for the fans to download their app. A digital launch is essential for a digital product. Swansea’s brought 12,000 downloads in 2 months and 2,300 active users. However don’t forget the traditional media… Big screens and magazines brought +25,000 downloads in 6 months and 5,600 active users. Fans want a complete experience, but with small effort. Sign in once, get access to all. Influencers mean different things to people – can be club’s players, celebrities, or simply fans that supporters resonate with. 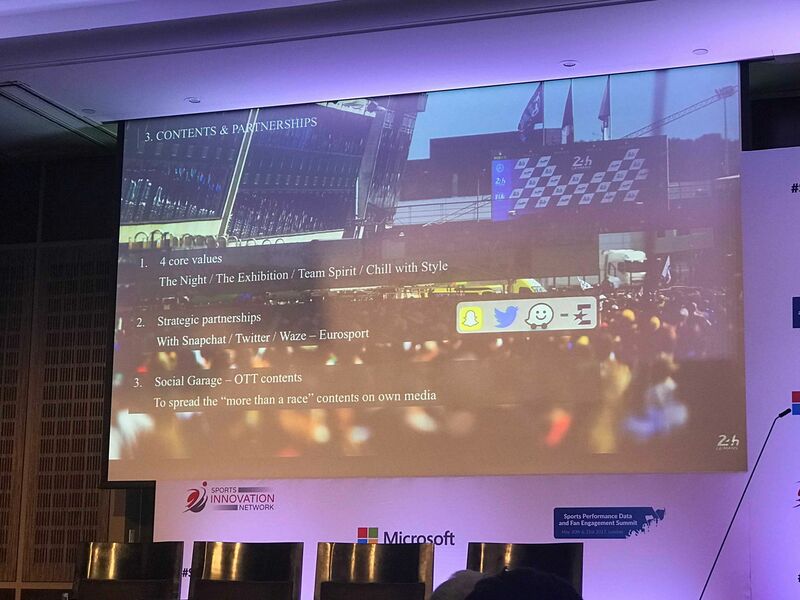 For some players, club have special content strategies that can create more engagement. Swansea has 15 celebrities in the US that have shares at the club. They have been used as influencers in the US market, but they haven’t been mentioned to the UK market. Tom mentioned that clubs still face brands that seem cautious when paying for esports influencers. Participants habits have changed in football. The FA wants a direct relationship with the football public. The FA has been working to make football a 21st century experience: easier, simpler, more rewarding and personalised. One of the projects has been creating a matchday app which makes the lives of sport organisers a lot easier. The campaign ‘For All’ specifically targeted underrepresented groups in the phenomenon such as females or deaf and disabled people. The FA has a target of collecting over 5m data points by 2020. LTA heavily focussed on creating digital platforms to help fans, incorporating them with the CRM and their competition management system. The FA has the highest number of youth teams ever (60,000+). However, males aged 14+ have a significant drop off. Participation in tennis increases a lot around Wimbledon. With the event coming soon, LTA will try to keep people engaged for as long as possible. The FA aims to win the Women’s World Cup next year and inspire the next generation of talent. To do that, they need to make sure that infrastructure and opportunities are in place and available in case that happens. imin: The early part of the digital journey can still be improved. LTA: There is an opportunity to improve the standard of ball machines using AI. The FA: Make sure that the customer journey works. This is particularly challenging with an aging workforce that is quite resistant to the development of digital solutions. There are 3 main pricing strategies for sponsorships: comparables, media equivalency and cost-plus. Comparables – using other similar deals to value your own. Media equivalency – using TV-advertising as a proxy for value. Cost-plus – using a cost plus margin pricing methodology. Formula 1 tried to set a sponsorship model that is a bit different from just sharing with interested parties the standard time on screen. Sponsors are looking for: Brand Awareness, Brand Positioning, Customer Loyalty, Sales Leads, Networking and Employee Satisfaction. Formula 1 has a global reach of 503m, 21 races per season and 352m unique viewers. A company called Gemba launched ‘Turnstile’ a global breakthrough for effective sponsorship valuation. It takes under account the quality of exposure. 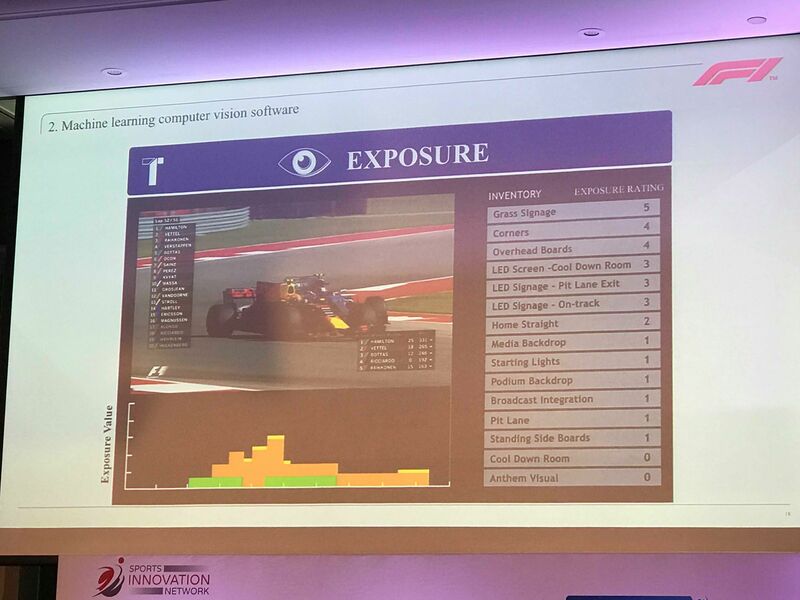 Formula 1 categorised the benefits sold to sponsors in: direct benefits, exposure and intellectual property (calculated through an index variable on market sizing, property algorithm and IP value per thousand). Le Mans aims to be the event most linked to the automotive industry and known as the biggest car exhibition in the world. They are starting to address to a disruptive market – interested in green, connected, car sharing and electrification. They have a very different positioning from Formula 1. For cycling and golf, exposure for brands looks very different. Both sports are very hard to measure in terms of exposure. 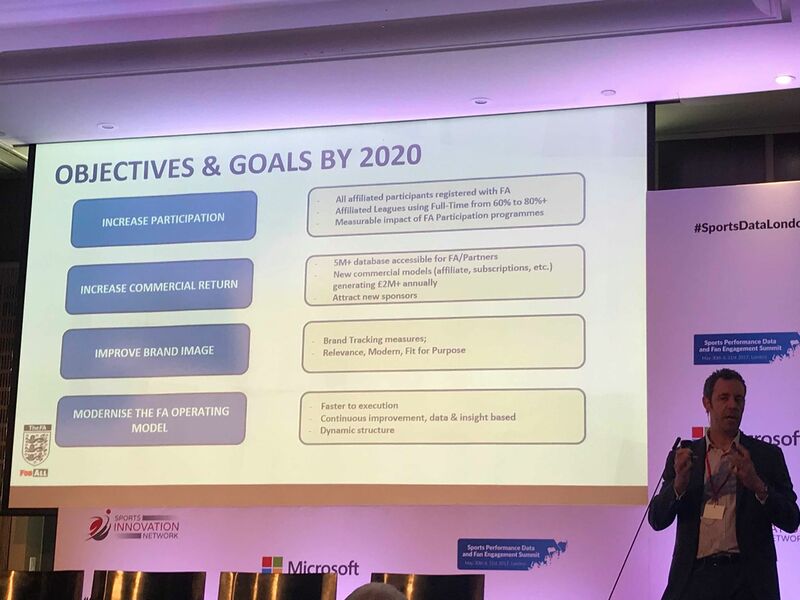 Because of that, they are trying to give value back to sponsors by creating experiences for them and providing close access to the athletes. Wasps did a study to see how much noise their fans are generating during the games. For NFL teams revenue is composed of national – 70% and local – 30%. Golf can provide unique opportunities as it is one of the sports where females can compete against men. Next Next post: Why football still matters?